The Lost Ring is an early and important multi-language, multi-cultural collaboration in China, and a gorgeous lab for experimenting with culture and virtual expression. My colleague at the Institute for the Future, Jane McGonigal, is the puppetmaster for an alternate reality game (ARG) called The Lost Ring which is centered around the 2008 Olympics and sponsored by the IOC and McDonalds. ARGs are immersive multimedia experiences that engage tens of thousands of players who must work together to figure out clues that are spread all around the real world and the Internet. Jane tells me that they have had 15,000 players in China who have engaged in some way with the game since it began in February of this year. One of the main characters in the game is Chinese, named Meihui; you can find her blog here. The other characters are from the US, the UK, Germany, Spain, France, Brazil, and Japan and are operating each in their own language. The story is wonderfully imaginative and complicated (check out the opening video piece) and starts with the mysterious banning of the Olympic Games in ancient times for dark, unknown reasons that are now to be revealed through the experiences of a global group of 8 6 young characters with superhero powers and pasts they can’t quite remember. In the real world it involves all kinds of local activities, competitions, and even new “lost sports” such as creating labyrinths of humming people. The Lost Ring now has players all over the world. It is fascinating to watch how this kind of highly emergent, non-rules-based, collaborative game is diffusing into China. 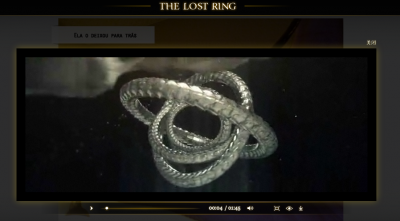 There are well established groups of ARG players in places like San Francisco, New York, and London, who have years of experience doing this sort of thing and pretty quickly set up their own amazing Lost Ring wiki and started running with the information. And the game is designed to be impossible to make serious progress in unless you can figure out how to be part of a collective. But in China, where this kind of gaming doesn’t exist, it’s hasn’t been so easy to engage a distributed community and link it up to a global community of players who mostly don’t speak Chinese. There are a number of issues for Chinese players: 1) The concept of this kind of game is hard to translate into the Chinese context. Chinese players simply haven’t had this kind of experience before. It’s about wide-open exploration and discovery. 2) The game relies on the Internet to find clues and to coordinate information between global teams; the Great Firewall blocks Chinese players from reaching some of the key sites necessary for game play; and 3) When players do get to the online sites, they find most of the important, emergent, player-generated information is not available in Chinese. For instance, the main player wiki tracks information and discoveries for the game as whole, but according to Meihui’s website forum, PRC players have had difficult accessing it. Even if they’re able to get there, there are only a few pieces that are translated into Chinese. What seems to be happening, however, is that the translation problem is becoming a feature of the game, not a bug, which is perfect. The community is self-organizing to deal with the communication problems, which appear to be most acute with the Chinese language materials. There has been a group effort to translate more of Meihui’s posts into English, and to translate other primary game materials into Chinese, as you can see at this unfiction forum post. MeiHui posted Chapter six and wrote: “Help!!!! I want to read it too!! !” (that was the only thing I could read). As far as I understood has MeiHui no idea what is going on. She needs a translation of all chapters and she needs a contact person. In 5-10 years this won’t be an issue, but for now the ARG global gamers have had a hard time connecting with, mobilizing, and empowering the PRC gamers. It doesn’t help that Meihui, the Chinese character in the game, is from Taiwan and so presumably less familiar with PRC online forums, etc., than someone from the PRC itself. She might be in the PRC now: Meihui has been posting tweets on her Twitter account, helpmeihui, from Yinchuan and Suzhou (as you can see from this global map of tweets and videos from the game’s characters), but I’m not sure if that means she is actually there or not.